In this section we intend to publish an update on solar activity in visisble light. All solar imaging, unless otherwise stated, is done using 100mm achromatic [full-disc with Orion Glass Filter (OGF)] and apochromatic refracting telescopes (large scale) using Polaroid diagonal attachment devices (PF). Never observe the Sun with or without optical aid unless appropriate filters are used. To look at the Sun without protection can lead to permanent blinding. Optical devices concentrate the Sun’s light and heat into a small area thereby raising temperatures to inflammable values within seconds. Please note that in future, solar images will be on site to cover approximately fifteen days (non-consecutive or otherwise) in order to avoid overloading the system! Full disc images frequently show indistinct areas “highlighted”. We only show detailed images of larger or more interesting areas. These are sometimes obtained using a more refined instrument than our standard 100mm archromat, but seeing conditions have to be good to warrant this extra work. 2017 September 05. Large sunspot groups pass solar central meridian. 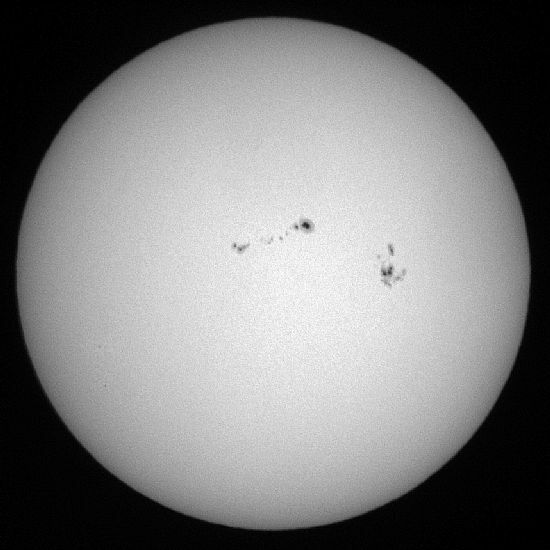 The first significant sunspots for several months. 170905 09h 50m UT. 100mm achromatic refractor, Orion Glass Filter. Exp. 1/1000 sec.